Knit work gloves can have coatings of latex, nitrile, PU (polyurethane) and PVC (polyvinylchloride). Comparing to knit gloves coated knit gloves provide much higher level of hands protection from mechanical injures and dirt. Latex, nitrile or PVC coating creates a barrier stopping liquids as well as the air. On the contrary PU coating has a very good breathability but liquids will also penetrate it easily. Foam latex easily produces textured coating to prevent slipping. Foam latex work gloves will be handy for working with polished surfaces and glass. Though, it should be noted that latex coating is ruined quickly by contacts with animal, vegetable fats and greases. It is better to use nitrile coated gloves for operations with such substances present. 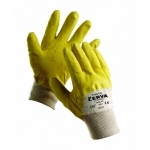 PU coated gloves will do better for higher abrasion dry works requiring good hands sensitivity.